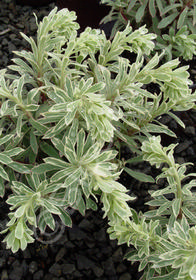 Striking gray-green & silver-white variegated foliage creates a tight mound. Flower spikes open to display green & white-variegated blooms in spring. Excellent cut flower.